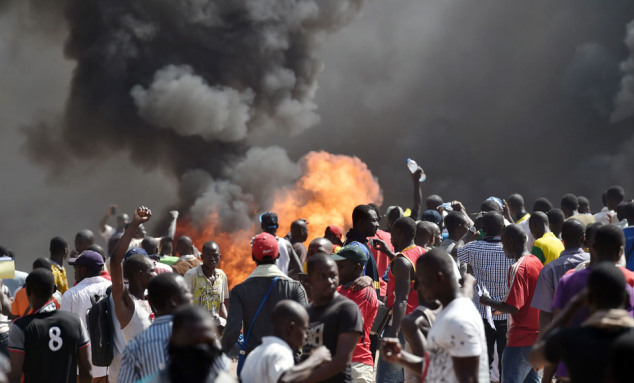 OUAGADOUGOU, Burkina Faso — Protesters stormed Burkina Faso’s parliament and set its main chamber ablaze Thursday in the most significant challenge ever to the president’s 27-year rule in one of the world’s poorest countries. The demonstrators wanted to a block a vote in parliament that would have allowed President Blaise Compaore to seek a fifth term. State television and radio went off the air and it was not immediately clear where Compaore was. “It is over for the regime!” and “We do not want him again!” shouted demonstrators when they heard that the vote on term limits had been stopped. Flames enveloped the main building in the parliament complex, and many lawmakers fled to a nearby hotel. “It is difficult to say what happens next, but things are out of control because the demonstrators do not listen to anyone,” said Ablasse Ouedraogo, an opposition lawmaker. In a bid to restore calm, military leaders met Thursday afternoon with the influential traditional chief of the country’s largest ethnic group, the Mossi, according to Jonathan Yameogo, a spokesman for the ruling party. Burkina Faso has long been known for its relative stability in volatile West Africa, though tensions have been mounting over Compaore’s plans to extend his rule. The president took power in a 1987 coup and has been elected four times since, though the opposition has disputed the results….